In early 1999, Etablissements Jean-Pierre Moueix purchased a property in Pomerol called Château Certan-Giraud. The property consisted of two distinctly different parcels; the parcel on the elevated part of the property was renamed Château Hosanna and the remaining parcel was later sold. 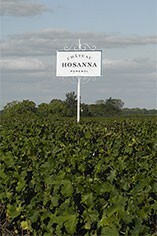 Hosanna's vineyards lie adjacent to those of Petrus, Lafleur, Vieux Château Certan. 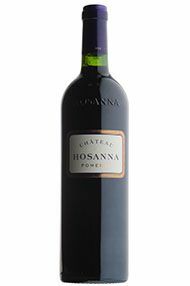 Château Hosanna has a significant amount of 40-year old Cabernet Franc vines which are planted on 30% of the vineyard. The wine is a blend of 80% Merlot and 20% Cabernet Franc. 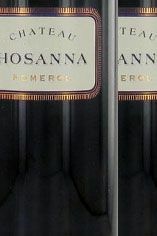 Christian Moueix believes that the fine, gravelly soil and high percentage of Cabernet Franc give Hosanna the potential to be the Cheval Blanc-style wine in his portfolio. 4ha vineyard. Powerful but subdued. 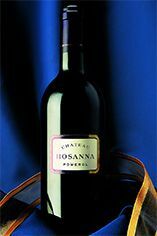 Masses of dark fruit on the nose – blackcurrant to the fore. Huge depth on the palate backed by abundant tannins that are finely polished with no aggression. Freshness and enormous length on the finish. The outstanding 2008 Hosanna, a blend of 80% Merlot and 20% Cabernet Franc, possesses the extraordinary complexity and aromatic intensity of a great vintage of Cheval Blanc. Unctuously-textured with a dense purple color, excellent richness, and dense black fruits intermixed with forest floor notes, this sensational wine will merit close to a three digit score when released. The tannins are high, but very ripe and melted, and the wine’s purity is awesome. Give it 3-4 years of bottle age, and enjoy it over the following two decades.